Almost 20 percent of Americans can claim to have German ancestry. Therefore the traditional fall festival Oktoberfest is a popular event in many cities around the country. Oktoberfest is celebrated every fall from approximately mid-September until early October. Why is Oktoberfest celebrated in September? The event has been celebrated in Germany, and especially in Bavaria, since 1810. That year, what started as prenuptial festivities for a royal wedding, turned out to be so popular that the local folk decided to recreate the fun the following year. Oktoberfest in the USA roughly follows the same calendar as the one in Germany, and includes lots of beer drinking, oompah bands, and gobbling down German food like bratwurst and knockwurst. Does that sound like a fun time to you? If you said "Jawohl!" (German for an emphatic "yes"), take a look at the following list of the most popular places to celebrate Oktoberfest across the USA. More than half a million revelers visit Cincinnati each year for Oktoberfest, making it the largest Oktoberfest in the United States. In fact, Oktoberfest Zinzinnati is the second largest Oktoberfest in the world after the one in Munich. In addition to seven stages of music and more than 30 food vendors, Oktoberfest Zinzinnati is overflowing with beer. According to organizers "more than 800 barrels of beer, or 1.6 million ounces, are consumed each year at Oktoberfest, the approximate capacity of a small microbrewery." Who can forget Ferris Bueller singing "Danke Schön" on a float at the German heritage parade in the film "Ferris Bueller's Day Off?" Indeed, German roots run deep in Chicago, which makes it one of the best places in the country for Oktoberfest revelry. Get your beers and brats at these great Chicago Oktoberfest events. German heritage is very prevalent in Western Pennsylvania, so it's fitting that the Pittsburgh area has a couple of Oktoberfest events worth checking out. The best known Pittsburgh area Oktoberfest festivals include the Pennsylvania Bavarian Oktoberfest, billed as Pennsylvania's largest Oktoberfest, and the Penn Brewery Oktoberfest. Pittsburgh's Penn Brewery hosts this event in its biergarten and brews a special Oktoberfest beer for the occasion. St. Louis, Missouri, has a sizable German community, so it has several places where you can celebrate. Our St. Louis guide has created a round-up of the top places to celebrate Oktoberfest in St. Louis, the largest of which is Soulard Oktoberfest. It's no surprise that sprawling Los Angeles has as many as 10 different Oktoberfest celebrations from which to choose. Oktoberfest in Los Angeles ranges from traditional festivals, such as the long-running Alpine Village in Torrance and OldWorld in Huntington Beach to the loosely German-themed Rocktoberfest street and music festival. The Nation's Capital and environs has quite a number of Oktoberfest, ranging from beer bashes at local breweries to an Oktoberfest at Jessup, Maryland's Blob Park, purported to be America's first Oktoberfest. Learn more about all the Oktoberfest events in Washington, DC. If there's an event that revolves around drinking, you can be sure that New Orleans will be up for celebrating. While New Orleans is not known for its Germanic culture, there are many pubs, clubs, and beer gardens where you can celebrate Oktoberfest in New Orleans. The biggest of these celebrations is at the Deutsches Haus, which celebrates with plenty of beer, schnapps, and chicken dancing. There are a few places to celebrate Oktoberfest in Atlanta, the most interesting of which is an Oktoberfest party bus that takes revelers to the small town of Helen, Georgia, decked out to look like an authentic German village. Phoenix is still hot in September - a perfect excuse to have a beer or three! There are many different places to celebrate Oktoberfest in Phoenix and take in the beer, bands, and wienerschnitzel. Fun celebrations of beer and food are to be found at several Oktoberfest events in the Reno/Tahoe area. Take in a Reno Pops concert of polka and waltzes or compete in the Oktoberfest Games at Squaw Valley. Typical games include beer barrel rolling competitions and a bratwurst toss. The great state of Texas has a little bit of everything, including several German communities, some of which still speak Texas German. For Oktoberfest activities, the best places to visit are New Braunfels, where the 10-day Wurstfest attracts approximately 100,000 visitors annually and Fredericksburg Oktoberfest, a weekend-long celebration of German heritage, food, music, and art in Texas's most famous German settlement. Additional Texas Oktoberfest ideas can be found in the "Texas" link in the header of this section. Washington, Oregon, and Idaho are splendid in the fall, perfect for donning lederhosen and enjoying German beer. Take a look at this round-up for some of the best known Oktoberfest celebrations in the Pacific Northwest. Just about every state in the Southeast has a big Oktoberfest celebration. 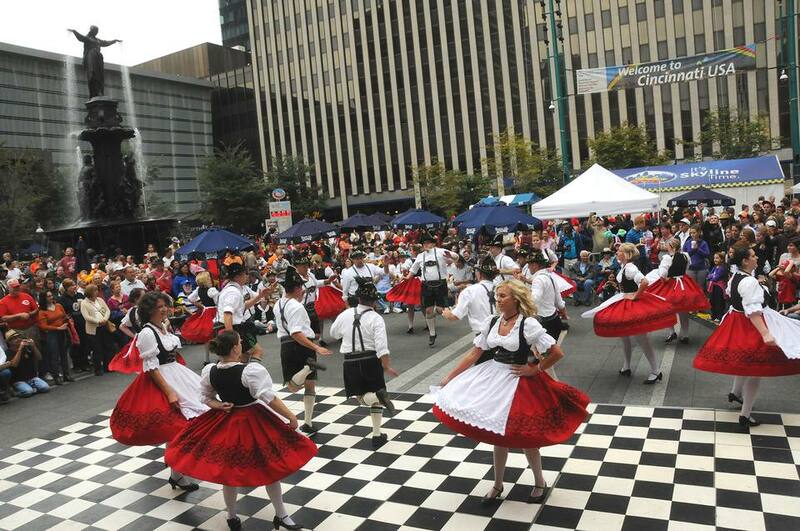 Check out these suggestions of Southeast U.S. Oktoberfest events, with particularly large festivals in Richmond, Virginia, Charlotte, North Carolina, and Covington, Kentucky.